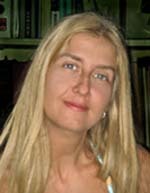 Dr. Lidija Mančić was born on August 18, 1968 in Zajecar, Serbia. She received her BSc and MSc degrees at the University of Belgrade, Technical Faculty in Bor – Inorganic Chemistry Department, and her PhD in Materials Science at the Universitz of Belgrade, Centre for Multidisciplinary Studies (PhD thesis: Conducted synthesis of nanostructured oxide powders from the viewpoint of production of materials with predicted properties, 2004). Since 2006, she has worked occasionally at the Pontificia Universidade Catolica do Rio de Janeiro, at first within the framework of her post-doc tenure and after as a visiting researcher on topics related to the development of 1D and 2D TiO2 nanomaterials. She is the coordinator of the scientific research under the Cultural, Education and Scientific Agreement signed between the Faculdades Catolicas RJ (Brazil) and the Institute of Technical Sciences SASA and the manager of the Business-Technical cooperation with the Serbian company PRIZMA. She is involved in national and international projects, including COST actions. She was elected a Principal Research Fellow in 2014. She published more than 80 scientific papers in WoS-indexed journals, and her research outputs have been cited more than 800 times (h=15). The main field of her research is related to the synthesis and characterization of 1D, 2D and 3D nanostructures produced via spray pyrolysis, hydro/solvo-thermal synthesis and intercalation/exfoliation processes. Her research activities are focused on nucleation and crystal growth of optically active hybrid nanoparticles during heterogeneous gas/liquid/solid reactions, core@shell nanoparticles, multifunctional biomaterials, “up” and “down” – convertors (Ln doped oxides and fluorides), and advanced biomarkers. She is a Technical Committee member for Nanotechnologies, at the Serbian Institute for Standardization, Serbian Ceramic Society, International Association of Advanced Materials in Sweden and American Ceramic Society. She is the Secretary of the Serbian Chapter of ACerS. Dr. Lidija Mančić is a reviewer for the Materials Research Bulletin, Journal of European Ceramic Society, Journal of Materials Processing Technology, Material Chemistry and Physics, Journal of Material Science: Materials in Electronics, Advanced Powder Technology, Journal of Nanoparticle Research, International Journal of Material Research, Optical Materials, Journal of Alloys and Compounds, Ceramic International, Powder Technology, Physica Status Solidi, Science of Sintering and Hemijska industrija. She has been working at the Institute of Technical Sciences of SASA since 1996.